Skin Care, Bath & Body. 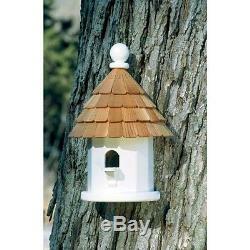 Lazy Hill Farm Designs Back Porch Wren Bird House - 41434. This Product Is On Sale For A Limited Time! Product Code: GD41434 Stock Status: In Stock & Available. Shop Our Store With Confidence! Product Features: The base of all of our bird houses and feeders are made of a solid cellular vinyl, a wood alternative that gives you the look and feel of wood, with little maintenance. The end result is an architecturally pleasing house that looks like wood, but lasts like vinyl. The redwood roofs are made to endure the elements year after year. Our copper tops age over time to a natural patina or you may choose a verde roof that will give you the patina look right out of the box! We make our bird houses and bird feeders with a solid cellular vinyl, a wood alternative that gives the look and feel of wood, with little or no maintenance. We also offer posts made of vinyl and our natural cedar posts for those that prefer the unstained, rustic look. The roof is made of redwood shingles. The body is made of solid cellular vinyl, a wood alternative, with the look and feel of wood, with little maintenance. Overall Dimensions: 5.5"(L) x 9.25"(W) x 14(H). We are a Boston-based store dedicated to providing you the very best products at the lowest possible prices while delivering the absolute best in personalized customer service. Simply put, we are a small company that specializes in big service. Unlike the big box stores and super-centers, we aim to provide you a specialized shopping experience that caters to you as an individual. Our dedicated staff will answer your calls without having to deal with automated prompts and robot customer service. Please note that the original packaging must always be used when returning product(s) back to us. At ShopFreely, we know how important it is to provide our customers with a safe and secure shopping experience. We want all our customers to be free from worry and have peace of mind while shopping at a trusted and reputable store. We treat the security of your personal information with the utmost care and use only the most state-of-the-art 128-bit hacker-safe SSL encryption to secure all data we collect at ShopFreely. How do you know when your data is secure? This indicates that you are protected within our 128-bit SSL secure server, where all data is encrypted for optimal security. Powered by Solid Commerce The All-in-One Listing, Inventory & Order Management Solution. The item "Lazy Hill Farm Designs Back Porch Wren Bird House 41434" is in sale since Saturday, May 02, 2015. This item is in the category "Home & Garden\Yard, Garden & Outdoor Living\Bird & Wildlife Accessories\Birdhouses".